Note - Starting with the Oracle VM Server for SPARC 2.0 release, the virtual disk multipathing feature can detect when the service domain cannot access the back-end storage. In such an instance, the virtual disk driver attempts to access the back-end storage by another path. The following figure shows a virtual disk multipathing configuration, which is used as an example in the procedure How to Configure Virtual Disk Multipathing. 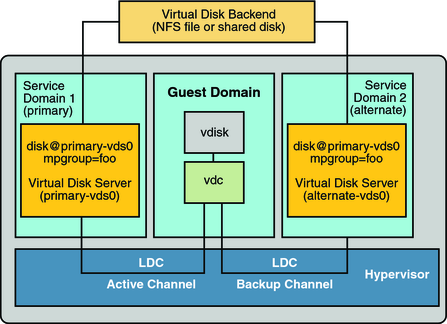 In this example, a multipathing group named foo is used to create a virtual disk, whose back end is accessible from two service domains: primary and alternate. With virtual disk multipathing, the path that is used to access the back end automatically changes if the back end becomes inaccessible by means of the currently active path. This path change occurs independently of the value of the virtual disk timeout property. The virtual disk timeout property specifies the amount of time after which an I/O fails when no service domain is available to process the I/O. This timeout applies to all virtual disks, even those that use virtual disk multipathing. As a consequence, setting a virtual disk timeout when virtual disk multipathing is configured can prevent multipathing from working correctly. This is especially the case with a small timeout value. So, it is best not to set a virtual disk timeout for virtual disks that are part of a multipathing group. For more information, see Virtual Disk Timeout. where backend-path1 is the path to the virtual disk back end from the primary domain. where backend-path2 is the path to the virtual disk back end from the alternate domain. After you configure the virtual disk with multipathing and start the guest domain, the virtual disk accesses its back end through the service domain it has been associated with (the primary domain in this example). If this service domain becomes unavailable, the virtual disk attempts to access its back end through another service domain that is part of the same multipathing group.